We provide a year-round competitive USA swimming program for swimmers of all ages and abilities. Our swimmers have achieved success at many levels, including college scholarships and participation in the Olympic trials. The club is large enough to be highly competitive, but small enough to provide personalized attention for each swimmer. 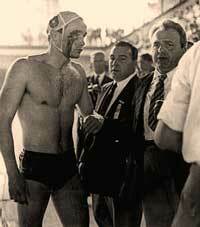 Ervin Zador was a 1956 Olympic Water Polo Gold Medalist in Melbourne. For over 40 years, he dedicated his life to every swimmer with the opportunity to develop their swimming skills. He spent the last years here in Ripon and left a legacy of extraordinary coaching success. His influence on swimmers went far beyond the pool, helping them excel their physical and mental strength. You can read more about Ervin and his amazing life in Wikipedia, Smithsonian Magazine or watch his documentary movie Freedom's Fury.